I have a small tear and impengment in my rotator cuff. It is painful to reach, push, pull, lift etc. 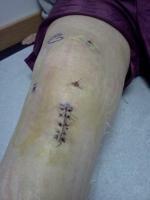 Orthopedic doctor wants to do sugery but I've heard the surgery is very painful as far as the recovery. What would you recommend? How long would i be out of work?